Tag Archive | "Hurricane Irma"
“That is extraordinary by itself,” Dr. Joel N. Myers, AccuWeather founder, president and chairman, said Monday. “And also unprecedented is that this particular storm, Irma, has sustained intensity for the longest period of time of any hurricane or typhoon in any ocean of the world since the satellite era began,” Myers said. Irma has great staying power, and it is a unique storm. It had a brush with several islands in the Caribbean and ran on land in Cuba. It then hugged the Florida coast as a major hurricane. “The storm is not only intense, it is also very large. The area affected by the strong winds along the west coast near the center of the storm will barrel along and hug the coast closely heading due north, and will bring winds gusts of well over 100 mph and conceivably over 125 mph,” Myers predicted earlier this week. These types of storms cause extremely hazardous conditions, including flying objects, fallen trees, downed power lines, which carry the potential for electrocution, broken window glass on homes and cars and damage to roofs and other structures. 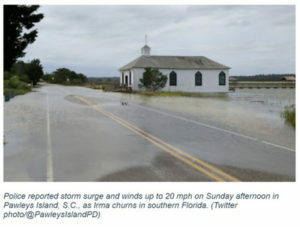 Storm surge was another major threat. 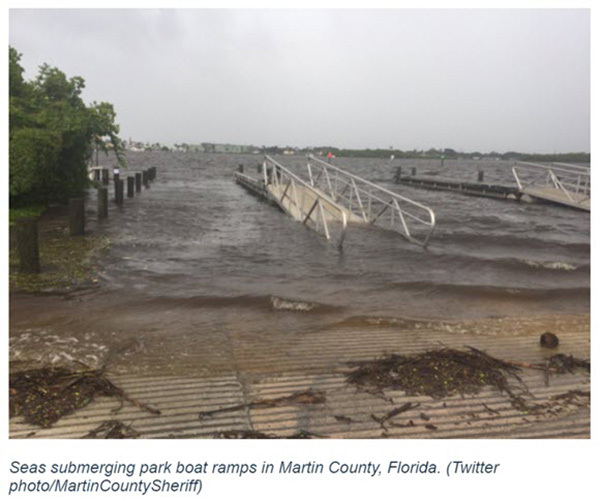 Hurricane Irma caused damage from wind, flooding from heavy rain and damage from the sea in different places in Florida. While the storm weakened as it pushed through the state, heavy rainfall over North and Central Florida from Hurricane Irma swelled 23 rivers and creeks to beyond flood stage Wednesday, threatening homes along their banks and potentially forcing a massive re-routing of drivers along I-75, according to the Miami Herald. “We believe the damage estimate from Irma to be about $100 billion, among the costliest hurricanes of all time. This amounts to 0.5 of a percentage point of the GDP of $19 trillion,” Myers said. “We estimated that Hurricane Harvey is to be the costliest weather disaster in U.S. history at $190 billion or one full percentage point of the GDP. Together, AccuWeather predicts these two disasters amount to 1.5 of a percentage point of the GDP, which will about equal and therefore counter the natural growth of the economy for the period of mid-August through the end of the fourth quarter,” Myers added. “Some of the losses will be covered by insurance, some will not, so the losses will be felt in a variety of ways by millions of people. Many millions of people have already been evacuated, so their lives have already been affected and they have incurred costs of one sort or another,” Myers said. More than 400 Soldiers departed Michigan hometowns and National Guard armories across the state, on Monday, Sep. 11, in preparation to go to Florida to support the Florida National Guard with relief efforts in the wake of Hurricane Irma. One CH-47 Chinook helicopter, with eight air and ground crew personnel, departed from Selfridge Air National Guard Base, Mt. Clemens, Mich. The crew is likely to provide aerial support for personnel and logistical movement. They will stage in North Carolina, then move to Cecil Field, Jacksonville, Fla., once the weather allows. Approximately 425 Soldiers from 3rd Battalion, 126th Infantry Regiment left four Michigan National Guard armories for Camp Grayling, Mich., the first leg of their trip, where they consolidated and packed equipment, includes more than 120 vehicles and trucks. The 3-126 Infantry is expected to deploy to the west side of southern Florida where they are likely to provide humanitarian assistance and security. The battalion departed Grayling and headed for Florida on Wednesday, Sept. 13.